An Arts & Crafts small wall hanging or table top cabinet in walnut by Alexander Ritchie of Iona; c1900. Superb well patinated repousse metal panels and hinges to front; both with typical intricate Pictish design. Furniture pieces by Alexander Ritchie are incredibly scarce. 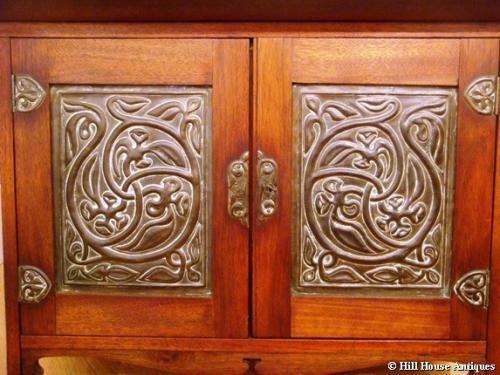 For a similar piece, a cupboard with part identical metal panels & hinges, is illustrated (archive photo) on p 24 of the book, Iona Celtic Art by E Mairi MacArthur.